Factory that was producing them (RMIF) no longer exists (for about 15-20 years already), along with the Soviet Union (USSR) itself. Unfortunately TI-s are very poorly designed and brake for no reason. There are barely any working TI-s in the world. And if you happen to be the one having a working TI - don't get too excited as it can just stop working at any moment. And what makes this even worse - there are no schematics of it anywhere to be found. They just dont exist. I assume that all schematics were just exchanged for vodka by the original engineers, or just lost. There is a rumour, that I will soon investigate, that one designer is (for some reason) still alive, and has the schematics. Being unable to do aynthing good, he sells access to the old schematics (disallowing to copy) for 100eur per paper... If he actually exists, I will find him, and everything he has will be open online here for free. So owning such a synth basicaly requires the user to be able to fix it. Frequently. - Digital part of the sound source (digital wave generator) consists of eight "PC-Speaker" chips from cloned PC-XT chipset (yes, the PIT chip 82c53), one for each voice. While original intel 82C53 are long living parts, russian clones die for no reason. My first TI-3 had two (of 8) already dead. 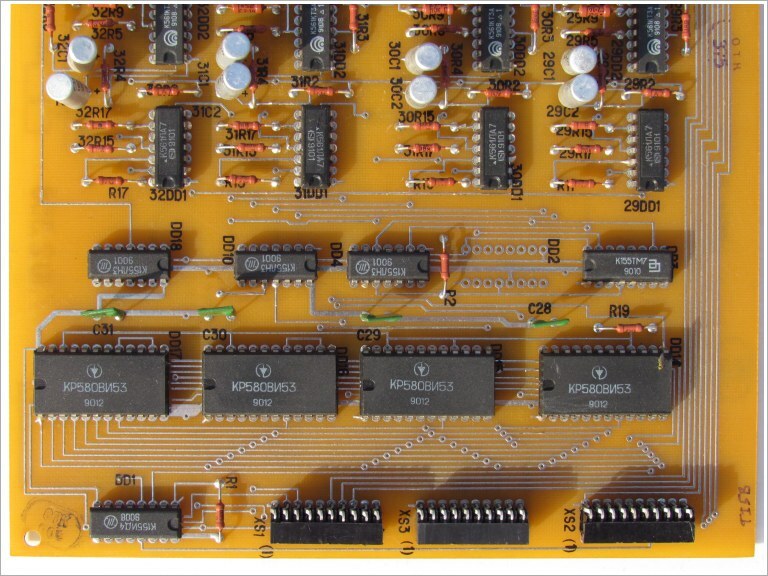 - Analog processing (VCFs and VCAs) part is a huge array of discrete analog parts, containing scary amounts of unreliable KT315/KT361 transistors and soviet capacitors. - Dynamic Voice Allocation engine is a total mess and does not realy work. It's comparable to and generaly slightly worse than DVAs of chinese toy keyboards. Somewhere this summer I plan to systematize all of the information I have reverse engineered out of these things. Then I'll post it there as soon as I will digitize that information. 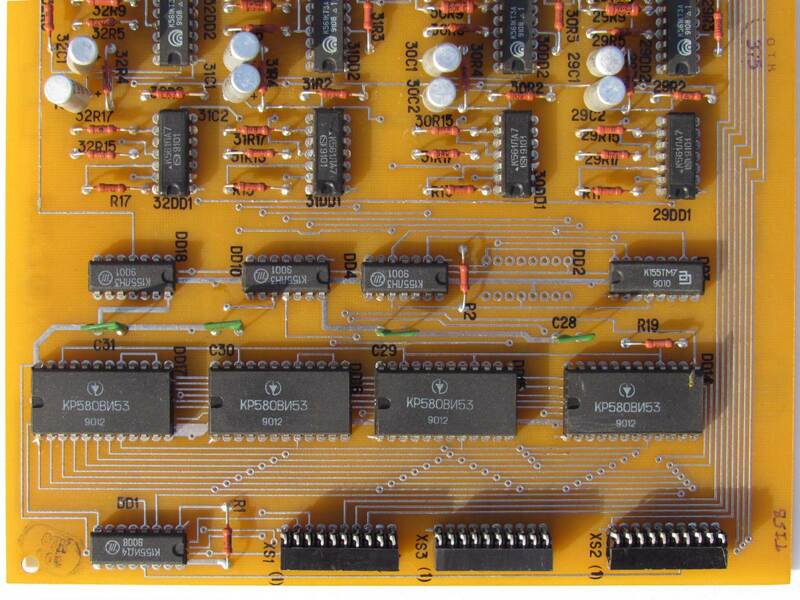 If you happen to be a keen oldschool 8080 assembly&disassembly coder, wanting to do some digging into obscure soviet code, drop me a line! I plan to create an alternative/patched/fixed firmware for both TI-3 and TI-5 with fixed DVA and added test mode (likely in a form of a separate ROM set due to low available space). Test mode is a critical necessity for the keyboard diagnostics in field. As soon as it will get made, it will be available down there for free! Regarding sounds, you can check the awesome Ruskeys.Net website. TI stands for "Taustiņu Instruments" in latvian, literary meaning "Keyboard Instrument". 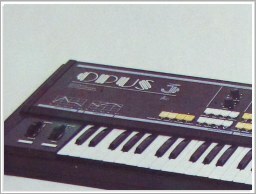 Before TI it was called RMIF OPUS-3. Wave generator of RMIF TI is made of two almost identical boards, each containing circuitry for four voices. Every voice has an independant i8253 (КР580ВИ53) timer chip, four s&h for analog controls, and a common (for all four voices) 4bit latch for wave shaping mux settings. Therefore waveform (instrument) settings can only be set per board, not per voice. Dual/split voice mode is achieved by using two boards, and therefore upper and lower parts allways have fixed polyphony of 4 voices. Although resonance has independant individual s&h for every voice, system controller does not make use of this feature. 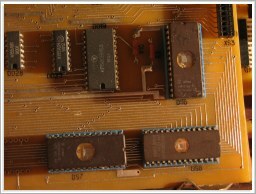 Four КР580ВИ53 chips for four voices. A 4bit latch (К155ТМ7) gets soldered into position DD3 or DD2 depending on board location in synth - upper or lower. Click for larger view. Control port pinouts and diagrams will be there eventually. Whenever I will manage to scrap up more of my old papers, I am going to gradually fill this void up. IF YOU HAVE A TI-3/5 and have an access to a ROM reader, please read chip contents, take a photo of the board and send me, so I can compare and post them out if it is of a different version. (Russian) ЕСЛИ У ТЕБЯ ЕСТЬ RMIF TI-3 ИЛИ TI-5, то было бы просто сказочно, если поделишся прошивками РФ'ок. Если у тебя нет ROM reader'а, то у соседа он точно есть. Надо, наконец, собрать всё техническое о этих синтах в одно место. Дорогие жмоты, паталогически скупые "ЛЕНИНГРАДСКИЕ МАСТЕРА" и другие полудурки - продолжайте сидеть на своих сраных секретных схемах и прошивках, тем самым подтверждая свою малоценность и чмошность. (Latvian) JA TEV IR TI-3 vai TI-5, pat ja nestrādājošs, tad būtu neparasti pasakaini, un pilnīgi neraksturīgi latviskajam skopajam garam, ja padalītos ar ROM čipu saturu vienkārši tā pat. Es pat varu atbraukt, atskrūvēt sinti un nokopēt čipus ar savu lasītaju, ja tas ir Rīgas rajona robežās. Nav ko skopoties un lielos biznesa plānus kalt, jo, kad pašam tie ROMi nojūgsies (a padomju РФ ir vareni amnēziski), tad pašam arī tie noloasītie imidži noderēs. I can combine an experimental one, if you realy need it, as I know TI's memory map. Paldies Jānim Vīksnam par sagādātajiem TI-5 ROM'iem! Also thanks go to Bart Jaspers from the Netherlands for yet another TI-5 ROM dumps, that confirmed the ones I had to be flawless originals.